The Unilever-owned company created what it calls The Natural Hair Trust to develop and test the products in realistic conditions, enlisting the help of 5,000 female consumers. Unilever points out that “multicultural hair brands tend to overindex on price versus general market hair brands,” so the bargain brand is betting it can find a receptive market. "Whether you're just starting out experimenting with products, or are a cocktailing pro searching for your next ‘holy grail’ -- it all comes at a price, and that's where Suave comes in,” said Soumya Donkada, Unilever’s innovation and strategy business leader. She said “Suave's brand heritage” makes it a natural fit for the new line. It features natural shea butter and pure coconut oil, contained in products like a cream detangler spray and a curl-defining cream. Suave enlisted hair stylist Ursula Stephen to work on the products. 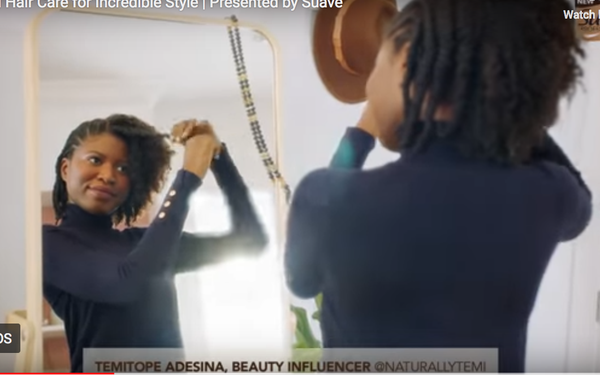 It also launched a digital and social media campaign featuring three of its Hair Trust influences, Temitope Adesina, Charlize Glass and Enocha Tellus, who will explain to consumers how natural hair requires special care. The new product line becomes the latest in a series of products by consumer packaged good companies aimed at minority consumers, a segment that not long ago fought for shelf space and attention by general market retailers. Earlier this month, Unilever's Dove Hair brand enlisted the help of singer Kelly Rowland on a music video featuring her new song, “Crown” meant to inspire hair confidence. The video includes vignettes of all kinds of girls talking about the razzing they've gotten on their hairstyles and colors.